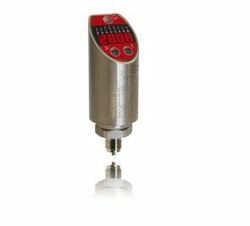 The devices of the series Precont TN10 with integrated digital evaluation electronic are compact sensors for measuring and monitoring of pressure levels. 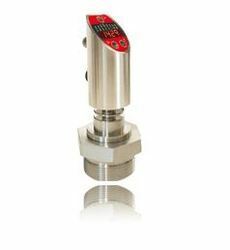 The completely fully electronic contact pressure device Precont MAC combines the advantages of a mechanical pressure gauge with the accuracy and longevity of a fully electronic pressure sensor. 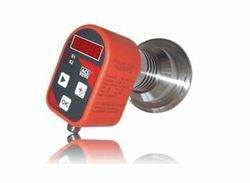 Therefore, on the large color TFT display of the Precont MAC a pressure gauge in the classical form is modeled to provide a quick and easy reading of the pressure. 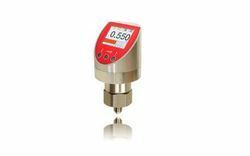 The measuring element itself consists of a high-purity ceramic capacitive cell, which guarantees the highest accuracy , robustness and long-term stability. The device has a switching output, in which both the switch and the reset point, and NC or NO contact function can be set. The set switching thresholds also appears in the display. The 4 -20mA analog output can be configured freely at zero and end points and provides the possibility to pass the measured value eg as with classical pressure sensors to the control. The Operation is simple using visual keys that work safely even at pollution of the control surface. The great advantage of Precont MAC is that in this contact manometer mechanical moving parts such as bourdon tubes or stepper motors has been omitted. Because of that the system is much more durable and less susceptible to vibration and temperature fluctuations. The Precont S10 is used in all fields of proceeding and process technique. The excellent characteristics like pressure strength, high chemical resistance, corrosion protection and insensitivity against temperature shocks allows the use in the hardest applications for the measurement of gases, steams and liquids. The Precont S20 is used in all fields of proceeding and process technique. The polysilicone resp. thin-film measurement sensor guarantees highest pressure ranges, good reproduceability and hysteresis, an up to 4 times overload resistance and a good long term stability. The devices of the series Precont S30 with EHEDG conform process connection for hygienic applications are used for supervision, control and also for continuous measurement of pressures from -1 up to +25 bar in gases, steams, liquids and dusts within closed containers or pipelines at process temperatures from -40°C to +150°C. The pressure sensor Precont S30 is expecially designed for the requirements in the food and semi-luxory item industy, as well as the pharmaceutical industry and biotechnology. This is especially relavant for the extreme conditions like chemical resistance against cleaning agents as well as insensitiveness against increases temperatures in the case of CIP/SIP cleaning processes. Due to the availability of adapters for the common process connections like varivent or connections acc. to DIN11851 with cone flange with nut groove for pipes acc. 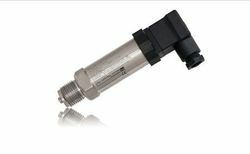 to DIN 11850, as well as a suitable weld-in sleeve the pressure transmitter can be installed in nearly hygienic application. The use of a strain gauge with metallic membrane guarantees excellent characteristics like high pressuren and pressure blow strength, high resistance against chemicals and corrosion, very good insensitiveness against temperature shocks and EM interferences, high accuracy and long term stability as well as low temperature sensitiveness. The Precont S40 is used in all fields of proceeding and process technique. The Precont S70 is used in all fields of proceeding and process technique. 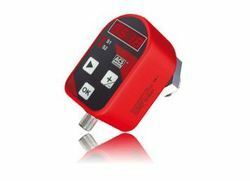 The devices of the series Precont PL with integrated digital evaluation electronic are compact pressure switches with an EHEDG conform process connection for hygienic applications for monitoring, regulation and continuous measuring of pressures form -1 up to 25 bar in gases, steams, liquids and dusts inside closed containers or pipes at process temperatures from - 20°C up to +150°C. The pressure switch Precont PL is especially designed for the requirements of the food and semi-luxury items industry and also für the pharmaceutical industry and biotechnology. This is especially valid for the conditions that occurs in CIP/SIP cleaning processes, like chemical resistance against cleaning solvents and insensitiveness against increased temperatures. Because of the availability of adapters for the common process connections like varivent or connections according to DIN11851 with cone flange with groove nut for tubes according to DIN 11850, and also a fitting weld-in sleeve, the pressure switch can be used in nearly every hygienic application. The use of a strain gauge with a metallic membrane and the corresponding excellent characteristics like high pressure and pressure blow strength, high resistance against chemicals and corrosion, very good insensitiveness against temperature shocks and EM interferences, high accuracy and long term stability and also low temperature sensitiveness allows the use in nearly all ranges of industrial environment. The pressure switch Precont PL is mounted in the wall of the pressure container or of the pipe. The system pressure is applied to the metallic membrane and causes there a deflection of the polysilicon strain gauge at the back side of the membrane. The pressure is transmitted to the polysilicon strain gauge by using a FDA permitted pressure transmitting liquid. The metallic membrane offers excellent characteristics like high pressure and pressure blow strength up to ten times the nominal pressure, good reproducibility and hysteresis and also good long term stability and a low temperature dependence. The pressure signal that is transmitted from the membrane to the strain gauge is transformed into an electrical signal that is recorded and processed in high resolution by a processor. The pnp switching output resp. outputs are driven according to the respective settings. When using the analogue signal current output the recorded pressure signal is adjusted according to the settings and transformed into a high resolution output signal of 4...20mA. By 3 sensor keys and the four digit LED display all settings for the pnp output resp. outputs, the display and also the analogue output can be set resp. adjusted. 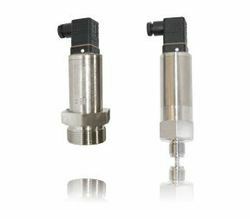 The device is an electronic pressure transmitter for continuous measuring of relative or gauge pressures in gases, vapors, liquids and dusts within closed container or pipes. The use of a piezoresistive measuring sensor with EHEDG conformal metallic membrane and the corresponding excellent characteristics, allows the use especially in hygienic applications. The device is mounted in the wall of the pressure container or of the pipe. The system pressure is applied to the metallic membrane and causes there a variation of the resistance of the strain gage at the back side of the membrane. The metallic membrane offers excellent characteristics like high pressure and pressure blow strength, vacuum resistance, high accuracy and reproducibility, good long term stability and a low temperature influence. A FDA-listed pressure transmitting liquid is used for the transmission of the pressure from the membrane to the strain gage. The pressure signal, that is transmitted by the membrane to the sensor is converted into an electrical signal and converted by the integrated evaluation electronic into a current signal 4...20 mA resp. voltage signal 0...10 V.
The device Precont MT with integrated analogue evaluation electronic is a compact pressure transmitter for continuous measuring of pressures from –1 up to 1000 bar in gases, vapors, liquids and dusts within closed container or pipes, also in explosive hazardous areas, at process temperatures from – 40°C to +100°C. The use of a strain gauge with metallic membrane and the corresponding excellent characteristics, allows the use in nearly all fields of industry. The system pressure is applied to the metallic membrane and causes there a deflection of the polysilicone resp. thin film strain gauge at the back side of the membrane. At measuring ranges of 0...25 bar and smaller, the pressure is transmitted by a pressure transmitting liquid to the polysilicone strain gauge. The metallic membrane offers excellent characteristics like high pressure and pressure blow strength up to five times the nominal pressure, vacuum resistance, good reproducibility and hysteresis and also good long term stability and a low temperature influence. The pressure dependent variation of the strain gauge output voltage is converted by the integrated evaluation electronic into a current signal 4...20 mA resp. voltage signal 0...10 V.
The device Precont KT with integrated analogue evaluation electronic is a compact pressure transmitter for continuous measuring of pressures from 0 up to 600 bar in gases, vapors, liquids and dusts within closed container or pipes, also in explosive hazardous areas, at process temperatures from – 40°C to +100°C. The use of a strain gauge with ceramic membrane and the corresponding excellent characteristics, allows the use in nearly all fields of industry. The system pressure is applied to the ceramic membrane and causes there a deflection of the thick film strain gauge at the back side of the membrane. The ceramic membrane offers excellent characteristics like high pressure and pressure blow strength up to four times the nominal pressure, vacuum resistance, very high resistance against chemicals, corrosion and abrasion, very good insensitiveness against temperature shocks, high accuracy and reproducibility, good long term stability and a low temperature influence. The pressure transmitter Precont KS measures pressures from 0...1 bar up to 0...400 bar and converts it into a signal 4...20 mA resp. 0...10V or into a PNP switching signal (pnp - closer). A thin-film strain gauge is used as pressure sensor. The small dimensions of the measurement sensor ensures a good behaviour against pulsating measuring media and vibrating installations as well as a very good reproduceability and hysteresis and an overload resistance of up to 4-times the measurement range. Due to the high natural frequency of the metallic membrane also fast pressure changings could be measured. The versions Precont KS0 + KS1 has a process connection with an inside places separation membrane in high-grade steel in G1/2A or M20 x 1,5 acc. to DIN 16 288. This process connection is available in two version, with and without damping system. The damping consists of an screw with a small slot that is placed at the medium side of the process connection. The variants Precont KS2, KS 3, KS 4 + KS 5 has a process connection with an front-flush separation membrane in high-grade steel in G 1/2A or M 20 x 1,5 for an seal in FPM or a metallic seal acc. to DIN 3852. The process connection is available with and without damping system. The damping consists of a choke that is placed at the measurement medium side. Ranges > 40 bar have an additional protection plate in front of the separation membrane. The version with damping should be used if an incompressible measurement medium with possible occuring pressure peaks over the measurement range should be measured. Pressure peaks can be produced e.g. by pumps, fast-closing vents, magnetic vents or controle cylinders. 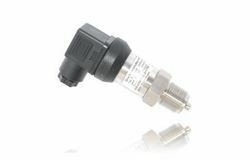 The pressure transmitter is conceived for advanced applications. The very small dimensioned housing in high-grade steel is designed in protection class IP65. registration of pressure in pipelines and containers. Because of an intelligent store management the internal data memory with a size of 64kB resp. 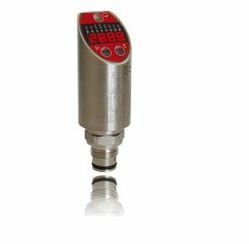 128kB allows a recording of minimum 21 600 up to maximum 216 000 measurement data sets at exclusive storage of the pressure measurement. Because of many possibilities of adjustment a highest flexibility in the application for control level and especially for pumping test or long term surveillance is given. The hydrostatic pressure signal of the ceramic membrane is measured by the integrated high-resolution digital electronic according to the adjusted measurement rate and is stored loss protected. Because of an intelligent store management the internal data memory with a size of 64kB resp. 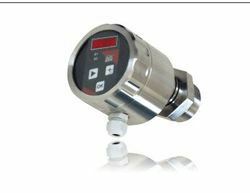 128kB allows a recording of minimum 21 600 up to maximum 216 000 measurement data sets at exclusive storage of the pressure measurement signal. Integrated over voltage protection modules prevents the destruction of the pressure sensor caused by atmospheric influences like e.g. thunder strike. The Precont D40 is used in all fields of proceeding and process technique. By the special construction the device is especially suitable for the use in areas with height air humidity and at condensed water formation where conventional devices can not or can only be used with an expensive placed air compensation capillary. The devices of the series Precont PS with integrated digital evaluation electronic are compact pressure switches for supervision, control and continuous measurement of pressures up to 60 bar. By this the replacement of mechanical contact manometer is possible. Besides a bright luminous 4-digit LED display there are up to 2 free configurable PNP switching outputs incl. 4...20mA output available. The use is possible in gases, steams, liquids, oils and dusts inside closed containers or pipelines at process temperatures from - 40°C up to +125°C. The extremely short reaction time of 3ms allows also the use in hydraulic units and in pneumatic applications. The pressure switch Precont PS is mounted in the wall of the pressure container or of the pipe. The ceramic membrane offers excellent characteristics like high pressure and pressure blow strength up to four times the nominal pressure, very high resistance against chemicals and corrosion and also very good insensitiveness against temperature shocks, high accuracy and reproducibility, good long term stability and at least a very low temperature influence. The devices of the series Precont PS with integrated digital evaluation electronic are compact pressure switches for supervision, control and continuous measurement of pressures up to 1000 bar. By this the replacement of mechanical contact manometer is possible. Besides a bright luminous 4-digit LED display there are up to 2 free configurable PNP switching outputs incl. 4...20mA output available. The use is possible in gases, steams, liquids, oils and dusts inside closed containers or pipelines at process temperatures from - 40°C up to +125°C. The extremely short reaction time of 3ms allows also the use in hydraulic units and in pneumatic applications. The system pressure is applied to the metallic membrane and causes there a deflection of the polysilicon resp. of the thin film strain gauge at the back side of the membrane. At measuring ranges of 0...10 bar and lower the pressure is transmitted to the polysilicon strain gauge by a pressure transmitting liquid. The metallic membrane offers excellent characteristics like high pressure and pressure blow strength up to five times the nominal pressure, front flush construction, good reproducibility and hysteresis and also good long term stability and a low temperature influence. The Precont TM is a very rugged overload resistive pressure transmitter for gases, steams, liquids and dusts in hard industrial applications. 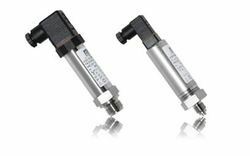 By use of a dry capacitive ceramic measurement sensor in combination with high-grade steel 1.4571 (V4A), this pressure transmitter can be also used in very aggressive substances. The ceramic membrane has also an extreme overload resistance, highest measurement precision, long life time and no need for maintenance. 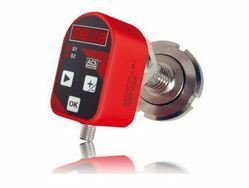 Looking for Pressure Sensors & Transmitters for Relative and Absolute Pressure ?